In Campaign Mode, you play classic tower defense scenario. 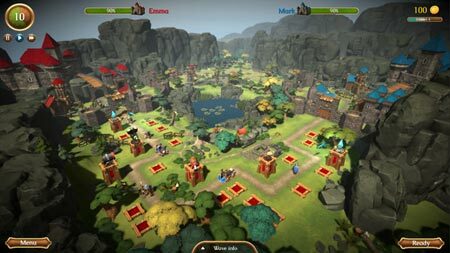 In Battle Mode, you not only defend your kingdom but also attack the opponent and upgrade economy. There are 7 types of towers of different strategic use and each with 3 levels of upgrades. If you get stuck in the game, check out the video walkthrough and gameplay for the game. This entry was posted in PC Games, Walkthrough and tagged Battle of Kings Cheats, Battle of Kings Game, Battle of Kings Gameplay, Battle of Kings Guide, Battle of Kings Hints, Battle of Kings Review, Battle of Kings Solutions, Battle of Kings Strategy, Battle of Kings Tips, Battle of Kings Walkthrough by Marvin. Bookmark the permalink.